The purpose of the Mt. 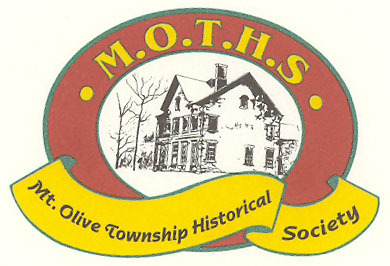 Olive Township Historical Society is the discovery, collection and preservation of Mt. Olive Township's history. The society will communicate and promote that history to all interested persons, through programs, publications and exhibits. The Mt. Olive Township Historical Society emerged from three concerned residents form a township meeting with the director of the Mt. Olive Library in Mid September 1998. During this meeting it was decided that Mt. Olive Township was very rich in it's own history. It was now time to capture, collect and preserve that history for the residents of the township to enjoy and reflect back on old times. The new residents moving into Mount Olive can also learn of it's rich past. With the support of the library and the dedication of the founding members, the Mt. Olive Township Historical Society held its first open meeting in October 1998. MOTHS NEW HOME - Our newest park, Drakes Brook Park, is our new home. A portion of the building, formerly used by the Blue Atlas Nursery, offered for our use is shaping up nicely. The space consists of a storage room, bathroom and a large room to be utilized as a working room. We are attempting to pull our collection and research together, take inventory and set up the area eventually hoping to be open for people doing research on projects related to Mt. Olive. Please visit our historical sites page to learn about Mt. Olive's rich history.